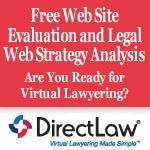 Free Law Firm Web Site Offer | DirectLaw, Inc.
How does your law firm website measure up? Is it findable on the Internet? Is your web site designed to convert prospects into paying clients? You will not be able to get new clients from the Internet unless you web site can be found when a prospect searches on a key word related to your practice. How does your website show up on the major search engines? Is your web site suitable for the delivery of online legal services? We will not only mail you a detailed report, you will also receive a 30-minute phone consultation. (if you want one) to discuss any questions you have and discuss areas for improvement. Find out the strengths and weaknesses of your site's structure and marketing elements and whether it is designed to maximize the benefits of the DirectLaw Virtual Law Firm platform. Complete the form to the right to get started. Insert your web address in the message area.